A RARE PHOTO : What a blessed sapling to be planted from the hands of Saksath Parameswaran !!! They say, “To Plant A Garden Is To Believe In Tomorrow…”. Our Periyava, Tri-kala Gnani HE is, planted so many seeds foreseeing the dire situation of our ancient cultures and religious and spiritual practices of India that survived several millennia. HE planted the seed for Veda Rakshanam. What we reap today is evident from so many emerging Veda Patasala and so many young Ganapatigal graduating out of it which would have otherwise been extinct by now. HE planted the seed for Gho Rakshanam. What we reap today is evident from so many Ghoshala and Pinjrapole protecting cows and so many organizations actively fighting against cow slaughtering. HE planted the seed for Shilpa Sastra Rakshanam. What we reap today is evident from so many temples being built with intricate sculptures and architecture, not only in India but across the globe. More importantly, Be it, “GURU BHAKTHI”, HE planted the seed of “Guru Bhakthi” by living as an embodiment of it. 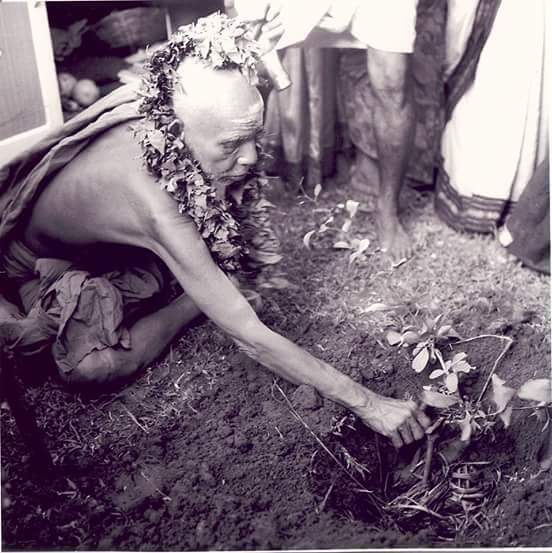 In every facet of our life from birth to death, Periyava has planted a seed / a sapling in our hearts so that we all would know our deepest roots and gather strength from it for a Dharmic way of living. While what HE planted in our hearts are trying to sprout out, the tall weeds in our mundane life (Maya) keeps shadowing the beautiful garden of our lives! Periyava, we pray to you ! Please remove the weeds from our mind and bless us to see the beautiful garden that YOU have planted. PRANAM PRANAM PRANAM ENDEIVAME SARWESWARA EN GURUVE. Maha periyava was all pervasive and made His mark in every sphere of life like Aadi Sankara Guru. Amazing how He , a self-made Guru, mastered all areas of knowledge, wisdom and experience and influenced every one who had His dharshan. And He still makes His presence felt. Pranaam Maha Periyava. Jaya Jaya Sankara Hara Hara Sankara!!! Intha photovai kanna Koti Punniyam vendum. What a rare photograph!!! How HE sits completely on the ground and planting!!! Need a thousand eyes to watch!!! The Parameshwara Avataram is planting a VILVAM tree. 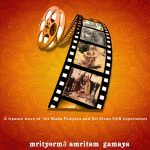 Maha Bhagyam to see this rare photograph of Maha Periyava and to read this great writeup. “Periyava, we pray to You ! Please remove the weeds from our mind and bless us to see the beautiful garden that YOU have planted.” Great prayer for all of us. Thank you! Hara Hara Shankara, Jaya Jaya Shankara! It is not just a Vilvam tree. All of his penance powers so as to bring pleasures only through the blessings of GODESS SHRI KAKSHI to each and every being of the entire Universe. SO GRACEFUL AND SELFLESS MAHA GNANI…. LET us try and to adhere HIS sayings to get the planted Graces….. Blessed to have the darshan of this photograph. Mahaperiyava Thiruvadi saranam.